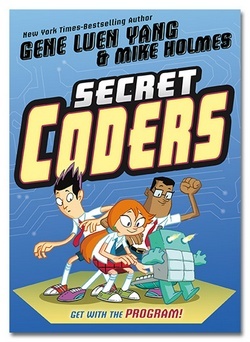 Secret Coders, a new graphic novel series written by Gene Luen Yang (American Born Chinese, Avatar: The Last Airbender, Superman), sets out to bring computer programming to kids and adults. Some people may not know that Yang, when not writing comics, is a high school computer science teacher. This is his attempt to combine his two passions – comics and programming. The graphic novel follows a girl named Hopper, name inspired by celebrated computer scientist Grace Hopper, on her first day at a new middle school, Stately Academy, that oddly looks like a haunted house. Hopper runs into some problems making new friends initially but ultimately becomes friends with Eni, a boy who has been trying to unlock the mysteries of the Academy. It turns out that the founder of Stately Academy has created secret puzzles that require some basic computer coding skills to solve. As the reader, you aren’t simply given the answer to the puzzles, you are given the opportunity to actually solve the puzzles before Hopper and Eni solve them on the following pages. I have been a computer programmer for over 30 years and when I was first learning programming there were 3 basic key concepts to remember: sequence, selection, and repetition. Some of those basic concepts are explored in the first book of the series. Readers who read this book will be able to figure out the concepts while being engrossed in the overall plot. The book also delves into binary numbers in a unique way, using robotic birds as a great mechanism to teaching how to calculate binaries. There is a certain aha moment that is reached when you discover how chapter numbers are presented. By the end of the book, the readers will be left wanting more Secret Coders. The book is recommended for ages 8 and up. The pages within the book are illustrated by Mike Holmes (Bravest Warriors, Adventure Time) entirely in black, white, and green colors. The green color tone seems to be an nod to the old school green monochrome computer terminals programmers used to have. Even though the pages are not in full color, the story shines in the mind as full color. The characters are diverse in race, gender, and interests. 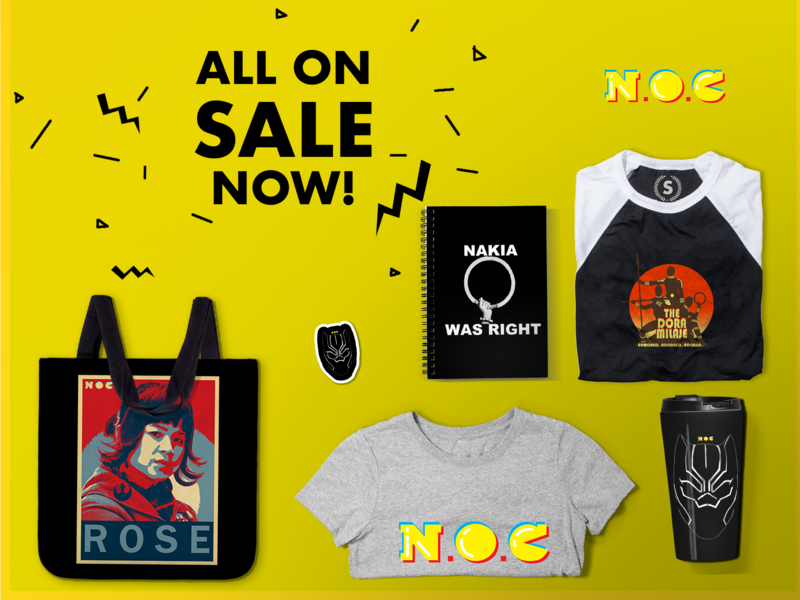 The characters are not portrayed as one-dimensional nerds who might be only interested in math but they also enjoy basketball and are, mostly, good at basketball as well. 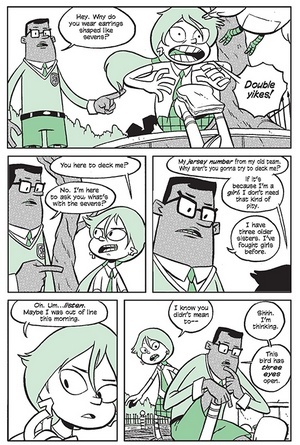 It’s refreshing to see the characters not stereotyped to be some socially awkward math geniuses. In fact, Eni is inspired by NBA star Chris Bosh of the Miami Heat, according to Yang. I am eager to see where the Secret Coders go from here and I’m hopeful that kids reading this will not see computer coding as something difficult. It’s a great start to a series that can both entertain and educate, something that we don’t often get from graphic novels. I highly recommend picking up Secret Coders, published by First Second Books, when it is released on September 29th. It’s a great way to teach coding concepts to both kids and adults. Advanced review copy was provided by First Second Books. Leisel is able to transcend the bigotry that surrounds her through education, drawing personal strength and elevating those around her through her blossoming literacy. On one level, as some critics have noted, the film does not break new ground. I am so excited about this book. Yang is one of our favorite comics creators.